Denimology – For Those Of You Addicted To Jeans. Raise your hand if you have a favorite pair of jeans. Raise your hand if once upon a time you had horrible, horrible jeans and you’ve vowed to never again look that bad. I’ve just linked to Denimology, and would love for you to check it out. The word dungarees (usually plural) is one of the few mainstream English words to have come from Hindi, one of the major languages of India. The source word in Hindi is ‘dungr’, and refers to a type of coarse cloth. Archaeologists found cotton fabric 5000 years old in West Pakistan. 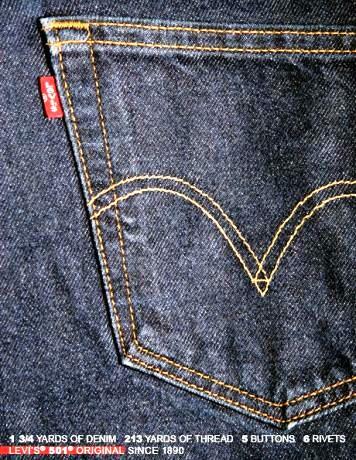 48% of the world’s trade in fabric is in cotton, from which denim is made. At least 225 pair of denim jeans can be made from one bale of cotton. The orange thread traditionally used to sew Levi Strauss blue jeans was intentionally selected to match the copper rivets that doubled the durability of the jeans. previous post: Princess Diana Would Have Been 46, And Prince Charles Would Have Been An Ugly Woman. next post: It’s Official! The Simpsons Live In Vermont! 48 queries in 0.632 seconds.